HOLLYWOOD star and Lyric Theatre patron Liam Neeson returned over the Christmas break to tread the boards of the south Belfast theatre which launched his acting career. The 61-year-old star of blockbusters, Schindler’s List and Taken met the cast of a new production of acclaimed play, Philadelphia, Here I Come! in which Neeson himself starred at the Lyric back in 1976. 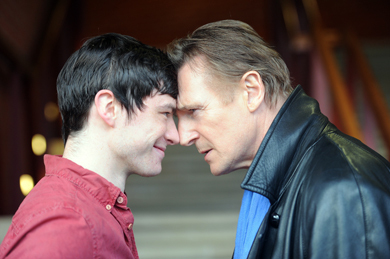 “Have you ‘taken’ my part?” Hollywood star Liam Neeson jokes with Gavin Drea during a visit to the Lyric Theatre, Belfast, where he met the cast of the new production of Philadelphia Here I Come! Drea will play the same role of Gar Private which Neeson played on the Lyric stage in 1976. The play opens on Feb 6 until March 8. (Photo by Stephen Davison). Liam chatted to up-and-coming young actor, Gavin Drea, who has revived the part Neeson played nearly forty years ago as Gar Private. He also met with Lyric stalwart Stella McCusker with whom he acted and who is also in the forthcoming play. Philadelphia, Here I Come! is one of Brian Friel’s most famous plays and is being revived at the Lyric to celebrate the Irish playwright’s 85th birthday in 2014. The play launched Friel on to the international stage in 1964 and deals with themes still relevant today as the economic climate has forced a new wave of Irish emigration. Set in the fictional town of Ballybeg (Baile Beag) in Co Donegal, it is a touching portrait of a young man Gar O’Donnell torn between his small-town home in Ireland and the bright lights of America. Friel’s big trick is to show the two sides of the 25-year-old – public Gar and private Gar – as he faces his dilemma. Dublin actor Peter Coonan best known for his role as Fran in RTÉ series Love/Hate, plays Gar Public opposite Gavin Drea as Gar Private, who also starred in Love/Hate. They head up a 12-strong cast on the Danske Bank Stage which includes local acting heavyweights, Niall Cusack (Macbeth), Stella McCusker (Uncle Vanya), Des McAleer (Hunger) and Marty Maguire (Mixed Marriage). The rest of the cast are Susan Davey, Dermott Hickson, James McCullagh-Murphy, Terence Keeley, Enda Oates and Marion O’Dwyer. Rehearsals began this week for Philadelphia, Here I Come! and the play is due to open in February. It is one of two Friel plays which open the Spring season at the Lyric Theatre as the Irish playwright marks a significant birthday on 9 January. Running simultaneously in the Naughton Studio is Friel’s rarely performed play Molly Sweeney which is a co-production with The Print Room, in London. Blind since infancy, this poetic tale revolves around a woman who is persuaded to have an operation to restore her sight. Her husband Frank is convinced she has nothing to lose; her ophthalmologist Mr Rice is not so sure. Through a journey of memory, hope and despair, the play begs us to not only see, but also understand other people’s points of view. Two Co Tyrone actors lead the cast with Molly Sweeney played by Dorothy Duffy, best known for her role in heart-wrenching film The Magdalene Sisters and Ruairi Conaghan (The Crucible). The play is directed by Abigail Graham. Brian Friel fans can avail of a 20% discount of tickets if booking both Philadephia Here I Come! and Molly Sweeney at the Lyric Theatre. Philadelphia, Here I Come! runs on the Danske Bank Stage from Thurs 6 February to Sat 8 March 2014, Tues to Sat 7.45pm, Thurs 1.30pm and weekend matinees at 2.30pm (Previews Sun 2 Feb 2.30pm, Tues 4 and Wed 5 Feb 7.45pm). Tickets from £10 to £24.50. Molly Sweeney runs in the Naughton Studio from Wed 12 February to 8 March 2014; Tuesday to Saturday 8pm; weekend matinees at 3pm (Previews Saturday 8, Sunday 9, Tuesday 11). Tickets from £10 to £16. The play then goes on tour to venues across Northern Ireland until the end of March. For more information on the Lyric’s season or to book, go to www.lyrictheatre.co.uk or contact the Box Office on (028) 9038 1081.